1-CD with 16-page booklet, 31 tracks. Playing time approx. 77 minutes. 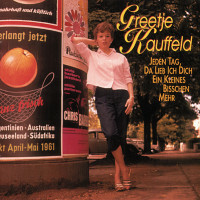 The success for the Dutch singer Greetje Kauffeld began in Germany in 1961 with her single Ruf (I am always there for you). It was followed by a real evergreen, just a bad copy. In 1964, in a duet with Paul Kuhn, she achieved hit parade success Every day, since I love you a little more, which led to ten more recordings together. With Wir kann uns nur Briefe schreiben she succeeded as a solo singer in another great chart success, a song that has the iron curtain as the background for an unfulfillable love that only happens in writing. A song that became a permanent guest at the desired radio concerts at that time. A song that unmistakably represents a piece of contemporary history of the sixties after the construction of the Berlin Wall. "I'll be a singer later." Greetje Kauffeld is just six years old when she surprises her parents with this statement. They smile, because they dismiss Greetje's utterance as childish wishful thinking. Three years later, the American pop singer Doris Day is the idol of the little singer, who was born on 26 November 1939 in Rotterdam and tries to sing after the American singer's big hits. In English, of course. although she didn't speak a word of English at the time. The parents still put a good face to the musical game, because they have completely different plans with the girl's daughter. Even as Little Greetje, who now sings in the school choir, she founded her first band at the age of twelve with which she took part in the youth competitions usual at that time. the parents are still smiling. When Greetje's voice crosses the ether waves for the first time, when a concert of the school choir is broadcast on the radio, the parents' smile does not fade away.11nd when she and her band made it to the junior final at the age of 13, Radio Hilversum broadcasts, the parents are still smiling. But you still have other plans for your daughter. After moving from Rotterdam to Zeeland, they put Greetje into a solid education. The father thinks she should become a telephonist, she has a future. Greetje submits, but the music determines her life in her free time. She is 16 years old when an ad comes to her attention: "'T he Skymasters are looking for a band singer." She's applying. And she's not surprised when she's invited to the audition. She is now convinced of herself and has the necessary stage- and microphone-flaging through her tingeln with her band too. Her parents are still smiling as she drives to Hilversum for her audition. Bep Rewold. Head of the Skymasters doesn't laugh when Greetje confidently steps up to the microphone and sings. On the contrary, he is enthusiastic about the fresh, unimaged voice that can sing antalkdillsdie titles as if they were written for sic in addition to current Dutch Taesschlager. Greetje outdoes her numerous competitors and gets the contract, which she proudly presents to her now no longer smiling parents on her return. Isis' time for the first public radio show, in which the Skymasters present her new singer alongside band singer Harry van der Velde, is filled with rehearsals, rehearsals, and more rehearsals. Ani February 1, 1957: Greetje's voice flatters itself into the ears of the radio listeners. Enthusiastic listener letters prove to the Skymasters that they made a good choice. The contract provides that Greetje will have one live broadcast per week with the Skymaster for three years. She will also go on concert tours with the orchestra, for which she will only receive travel expenses. Everything else is covered by the employment contract. Just one day after the first show she packs the suitcases with the musicians to fulfill an engagement in Germany. In summer the "fanzbrunnen' in Cologne is often the destination of the trip. But the Skymasters are also engaged as an accompanying band for the lintrneen, often performed in the 1950s, with well-known pop stars such as Evelyn Künneke, Rein' Garni, Rudi Schitricke or Fred !Irrtetmann. And with them, of course, Greetje Kauffeld, who is already getting to know most of the German pop stars before she takes the step onto the German pop stage. During the last ride of her Skymaster time she takes part in the'Festival de la canzone' in Venice on holiday "just for fun". Although she does not win the competition, she wins the attention of orchestra director Erwin Lehn and music director Wolfram Röhricht from Süddeutscher Rundfunk. The result is an invitation to Stuttgart for radio recordings. The recordings are so convincing that Greetje Kauffeld is engaged for the'Week of Light Music' in Stuttgart's Liederhalle. She is discovered twice Heinz Gietz offers her a record deal, and Klaus Überall plans to continue his popular TV series'Spiel mit Vieren' with her as the successor to Alice Ilabs. She doesn't think long, she signs both contracts. Because she knows that she can make a career in Germany from her guest performance tours with the Skymasters, where she is still under contract. With Paul Kuhn, Svend Asmussen and Ulrik Neumann, she appeared regularly on television from 1961 on in your musical fun'Spiel mit Vieren'. For her first German cliché record, in her I leimat, she has already sung about two singles in 1 Dutch and one EP in English. She went into the studio on May 2, 1961 without any noteworthy success. Ruf an is the name of the title, in which she is accompanied by the Cologne Dance Orchestra under the direction of Adalbert Luczkowski. The title Oh, Charly-Boy, which Ileinz Gietz wrote especially for her to a text by Ilan Bradtke, is recorded one day later. However, the record will not be the hoped-for success. Also from the successful team Gietz/Bradtke comes the title Only a bad copy, which also does not bring the hoped-for breakthrough, but which should develop into a real evergreen in the course of the years: Even more than three decades later, the original version of the song is still often played on radio with Greetje Kauffeld. Until the end of 1962 the young Dutchwoman recorded four singles for htlydor. Although none of the eight titles can be placed in the hit parades, Kurt Fritz and their discoverer Heinz Gietz still believe in them. When Gietz joined Electrola in 1963, she changed too. With the song Nur bei Dir she takes part in the German Schlagerfestspiele 1963 without great success. The title Sunday Melody becomes the theme song of a Frank. Elstner broadcast on the'merry waves of Radio Luxemburg' and in 1966 the title song of her first bogspielplatte, but he doesn't put it in the charts. I litparadenerldg only had Greetje Kauffeld with her first duel recording with Paul Kuhn, whom she knew very well from the joint television series. Every lie, because I love you a little bit more rbeltat suffered the two saucy and will be on I. February 1964 for the first time in the li tim rade. No wonder Heinz Gietz wants to repeat the success, but ten more Paul Kuhn/Greetje Kauffeld duets cannot follow on from the first hit. But Greetje alone will make it: On September 12 of the same year her song We can only write letters for the first time in the charts. A song that has the iron curtain as a background for an unfulfillable love that only happens in writing. A song that was a permanent guest in the radio wish concerts of the time. will. A song that is unmistakably a piece of the 60s after the Berlin Wall was built. "It was a great Eelg, but today, unlike some of my other hits, I don't sing this song anymore. The song has been overtaken by historical developments," says Greetje Kauffeld in October 1996. The'Schlagerzeit' of I lol Linden n., who moved to Munich and later to Stuttgart, lasts until 1967, when her contract with Electrola expired and she sought her musical happiness in the USA. She performs in Los Angeles, is on the TV show'Front Coast To Coast' together with Ray Brown and !lern Ellis as a guest of Joey Bishop. She is in love with the producer loop de Roo, whom she met in Germany at the Berlin radio and television exhibition. She realizes how much she is in love with him when he telegraphed her in 1969 (let him do his job in New York. She leaves everything in California and flies to her loop. She proudly tells him that at a casting for a musical in Las Vegas she was one of the very few who were allowed to sing her song to the end, but she got it (don't love role: she wasn't the type that German producers had in mind. loop de Roo doesn't need to persuade her to come back to Europe for long. Customer evaluation for "Jeden Tag, da lieb' ich dich... (& Paul Kuhn)"